HÀ NỘI — Việt Nam expressed its appreciation to Sweden for sharing expertise on good practices and technologies to support the development of public transport, Deputy Transport Minister Lê Đình Thọ said on Monday. Speaking at the roundtable discussions in Hà Nội on “Fostering efficient operations and management of public transport: Sharing the successful experience of Sweden in emerging countries”, Thọ said that Việt Nam had regularly improved its transport infrastructure system and transport services towards a more modern, safer and more convenient transport system, especially in public transport sector. Buses are now available in 60 out of 63 provinces and cities across Việt Nam. Last year, in Hà Nội and HCM City about 441 million and 307 million passengers, respectively, used buses. Urban railways and bus rapid transit (BRT) systems are being developed in the two cities to further promote public transportation. However, Việt Nam faces challenges in the development of public transportation, including a shortage of land for transport works – a result of non-matching between urban planning and urban transportation. It also faces a notable increase of private vehicles, at a rate of 10-12 per cent per year, and serious traffic congestion and illegal pavement encroachment, especially in major cities. “There remain shortcomings in applying technologies in transport management and monitoring,” Thọ said. Brian Hull, General Director of ABB Vietnam said that as in many developing countries, Việt Nam’s urbanisation process has caused many difficulties and challenges for public transport. The rapid pace of urban development often surpasses the capacity of local government to meet increased demand for services. The main issue is that there are limited funds available to develop the required technical and social infrastructure. “Technology will play a critical role in managing this process,” Brian said. He added that the industrial revolution 4.0 was at the heart of a smart city’s critical infrastructure and could reduce emissions through efficient and clean electrical transportation infrastructure; manage energy efficiency for buildings; improve leakage performance in the water networks; and offer common secure wireless platforms. Denis Brunetti, president of Ericson Việt Nam, Myanmar, Cambodia and Laos, said that a key driver for sustainable transport in Việt Nam is its urban population growth of 2.97 per cent per year – one of the highest in the region. Meanwhile, public transport meets less than 10 per cent of transport needs in major cities. The growth of e–commerce and the subsequent rise in logistical transport, alongside Việt Nam’s commitment to CO2 emission reduction, and the evolution of technology with new business and co-operative models are other key drivers. “The integration of Information and Communication Technology (ICT) and Transport Trade Services (TTS) with infrastructure and vehicles will increase safety, sustainability, efficiency and co-modality,” he said. Ericsson enables communications service providers to capture the full value of connectivity. Its products aim to help customers go digital, increase efficiency and find new revenue streams. 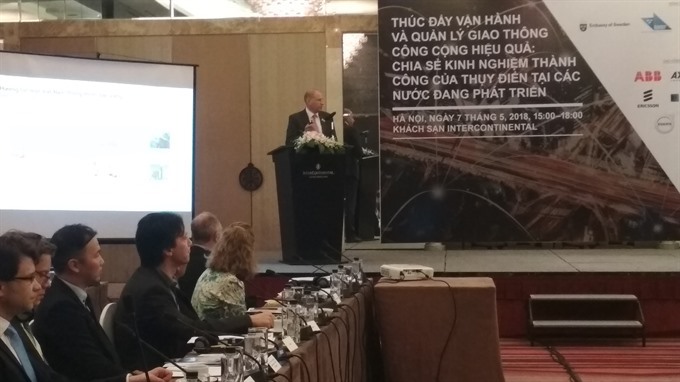 Addressing the roundtable, Swedish Ambassador Pereric Högberg said that with urbanisation and a growing middle class, cities in Việt Nam face many challenges, not least when it comes to transport. Sweden has long been at the forefront of urban planning, environmental friendliness and traffic safety. Since 1990, emissions in Sweden have been reduced by 9 per cent while GDP has increased by close to 50 per cent. Since 1970, oil dependence in Sweden has reduced by 90 per cent, and furthermore, the number of traffic fatalities has been cut in half from 2000 to 2013, reaching 30 per million habitants per year, among the lowest in the world. In Việt Nam as of 2017, around 40 per cent of the population lived in urban areas, and this is expected to increase to 50 per cent by 2025. With the government’s orientation toward sustainable urbanisation, public transport has become a key factor in the journey towards developing urban mobility. In its strategy for the development of public transportation to 2020, Việt Nam aims to make public transport the preferred option, in tandem with the control of private vehicle growth. By 2020, Việt Nam aims to have 20 per cent of buses and taxis using LPG, CNG or solar energy.